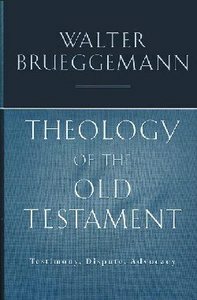 In this powerful book, Walter Brueggemann moves the discussion of Old Testament theology beyond the dominant models of Walter Eichrodt in the 1930s and Gerhard von Rad in the 1950s.Brueggemann focuses on the metaphor and imagery of the courtroom trial in order to regard the theological substance of the Old Testament as a series of claims asserted for Yahweh, the God of Israel. This provides a context that attends to pluralism in every dimension of the interpretive process and suggests links to the plurality of voices of our time. - Publisher The magnum opus of one of America's premier Old Testament scholars. Drawing on the metaphors and imagery of a courtroom trial, Brueggemann asks readers to weigh the testimony and countertestimony of Yahweh, the central character, while considering commentators' views on historicity, authenticity, reliability, and methodology. An intriguing platform for dialogue between modern pluralism and biblical faith. About "Theology of the Old Testament"
The magnum opus of one of America's premier Old Testament scholars. Drawing on the metaphors and imagery of a courtroom trial, Brueggemann asks readers to weigh the testimony and countertestimony of Yahweh, the central character, while considering commentators' views on historicity, authenticity, reliability, and methodology. An intriguing platform for dialogue between modern pluralism and biblical faith.